The Hong Kong Disneyland Resort is a resort built and owned by Hong Kong International Theme Parks Limited, a joint venture of the Government of Hong Kong and The Walt Disney Company in Hong Kong on reclaimed land beside Penny's Bay, at the northeastern tip of Lantau Island, approximately two kilometres from Discovery Bay. 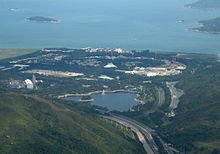 Officially opened on 12 September 2005, the resort contains the Hong Kong Disneyland theme park, the Hong Kong Disneyland Hotel, Disney's Hollywood Hotel, Disney Explorers Lodge and several retail, dining and entertainment facilities covering 1.3 square kilometres (320 acres) of the island. The Hong Kong Disneyland Resort is the second Disney park extension into Asia after the opening of the Tokyo Disney Resort more than 20 years ago. Currently, the Resort is overseen by managing director Stephanie Young who reports to Michael Colglazier, President, Disney Parks Eastern Region and Managing Director, Asia Pacific. In 1998, a Hong Kong theme park was proposed by Walt Disney Parks and Resorts. The designs made it the smallest of the Disneylands. The Legislative Council of Hong Kong gave approval in 1999 for funding the construction at a former shipyard. A joint-venture company, Hong Kong International Theme Parks Limited (HKITP), was created in 1999 with Disney investing US$316 million for a 43% equity stake in the project. The Phase One build-out included a projected 10 million annual visitor Disneyland-style theme park, 2,100 hotel rooms, and an area for retail, dining and entertainment. The project was estimated to create 18,000 jobs at opening (both Disney and other employment) and up to 36,000 jobs over the following 20 years. The Hong Kong Government estimated that the first phase of the project will generate a present economic value of HK$148 billion (US$19 billion), or about 6% of gross domestic product (GDP) in benefits to Hong Kong over 40 years of operation. In 2000, Disney announced a second Chinese theme park resort in mainland China. Tourism workers associations and lawmakers want Disney to drop the mainland project to protect this and general tourism in Hong Kong. Disney promised not to open such a park for eight years. Government Secretary for Economic Service Stephan Ip Shu-kwan and Walt Disney Attractions Chairman Judson Green signed the master project agreement in November 2000. The government began dredging for the park resort in July 2000. Fish around Ma Wan died as a result of land reclamation. The construction of the resort itself started in January 2003. The SARS outbreak of 2003 did slow but not stop building and saved HK$1 billion as construction cost dropped. Inspiration Lake, an artificial lake of some 12 hectares, was also created to serve the resort's water irrigation needs. In an effort to avoid cultural friction similar to what happened when Euro Disney Resort opened in France, Disney has taken efforts to make this new park reflect the local culture. Feng shui consultants have helped with the layout of the park and the grounds. Incense was burned when the construction of each building was completed, and one of the main ballrooms is 888 square meters in size, as eight is an auspicious number in Chinese culture, signifying fortune. The hotels will skip the number four when numbering of their floors because four is considered bad luck. Hong Kong Disneyland Cast Members speak English, Cantonese, and Mandarin. Around 500 of the Grand Opening Team were trained at Walt Disney World Resort while their home park was being constructed. Disney originally planned to serve shark fin soup, a traditional Chinese delicacy, at wedding banquets. Animal rights groups protested in June 2005, citing the declining shark population in global waters and the cruel methods sometimes used of cutting the fin and discarding the live sharks back into the water. At first, Disney removed shark fin soup from its menu but said that it would still offer the soup if their clients insisted on having it served at their wedding. They said they would distribute leaflets about shark conservation to discourage the choice. However, after constant and continuous pressure from environmental groups and schoolchildren, shareholders concerned about the company's image, Disney announced on 24 June 2005 that shark fin soup will not be served at all, because, according to their press release, "After careful consideration and a thorough review process, we were not able to identify an environmentally sustainable fishing source, leaving us no alternative except to remove shark's fin soup from our wedding banquet menu." Health inspectors were asked to remove their caps and badges when coming to inspect the facility after several reports of food poisoning. Although two of the officers did so, the department took offence. On 12 September 2005, Hong Kong Disneyland Resort and its theme park, Hong Kong Disneyland, officially grand opening ceremonies by the chief executive officer of the Walt Disney Company Michael Eisner, President and chief operating officer of the Walt Disney Company Bob Iger, Vice-President of the People's Republic of China Zeng Qinghong, and Chief Executive of Hong Kong Donald Tsang at 13:00 HKT. The park was projected to attract five to six million visitors in its opening year, mostly locals, tourists from mainland China and nearby Asian countries. Initially, the resort gained success during rehearsal stages; however, not long after the park officially opened, many locals criticised the size of the park and the attractiveness of the rides and attractions in the park. From 23-29 July 2006, Hong Kong Disneyland Resort hosted the 2006 Little League Baseball Asia-Pacific Region Tournament. The resort constructed two seaview stadiums and baseball pitches between its Disney Resort hotels for the tournament. The event attracted approximately 2,000 fans. To boost the park attendance, Hong Kong Disneyland introduced Summer Passes in summer 2006 to attract more visitors. Each Summer passholder could visit the park unlimitedly throughout summer 2006 for just HK$450. The park also provided exclusive treats for the Summer Passholder in the summer holidays to encourage them to visit the park several times, such as extending the operating hours of Fantasyland for passholders and releasing limited pins for passholders to purchase. Apart from these, the park offered free tickets to the friends and family members of the cast members. Each cast member can invite a limited number of friends and family members to visit Disneyland every day during the summer. Although the park had sold more than 60,000 Summer Passes throughout summer 2006, the park missed its target of 5.6 million in its first year, with only about 5.2 million guests entering the park during the first year of operation. The government overestimated Hong Kong Disneyland's attendance numbers during the Asian Financial Crisis. Rumour suggested that the relatively low-key celebration of the 1st Anniversary was due to the disappointing performance of the theme park. The Hong Kong park's attendance continued to be disappointing according to the Walt Disney Company's third-quarter performance released in August 2007. In addition, the South China Morning Post estimated the attendance of Hong Kong Disneyland will reach 4 million in its second year, far lower than its first year of operation, citing unnamed sources. The SCMP's sources are still unknown, and some of its speculation is a bit overly optimistic[according to whom?]. In December 2007, the Disney park admitted that the park had only attracted 4 million visitors in the year 2006–2007, which had fallen 23 percent when compared to the first year attendance. A new shopping district called Downtown Disney, as well as the third hotel, are taken into discussions. For long-term construction, with the reclaimed land reserved for the Phase Two Extension and the Disneyland park being blocked by the Park Promenade, a pedestrian walkway which links the Disneyland Resort Station, Disneyland park, Hong Kong Disneyland Hotel, and Disneyland Resort Pier. It is expected that a second Disney theme park will be built on that site. A Phase Three Extension is also being considered by the Walt Disney Company and the Hong Kong Government. On 10 January 2012, The Standard reported that Hong Kong Disneyland plans to build 4 more hotels. Disneyland's proposal includes building one large hotel and three smaller vacation-style hotels to be connected by a mini-tram system. 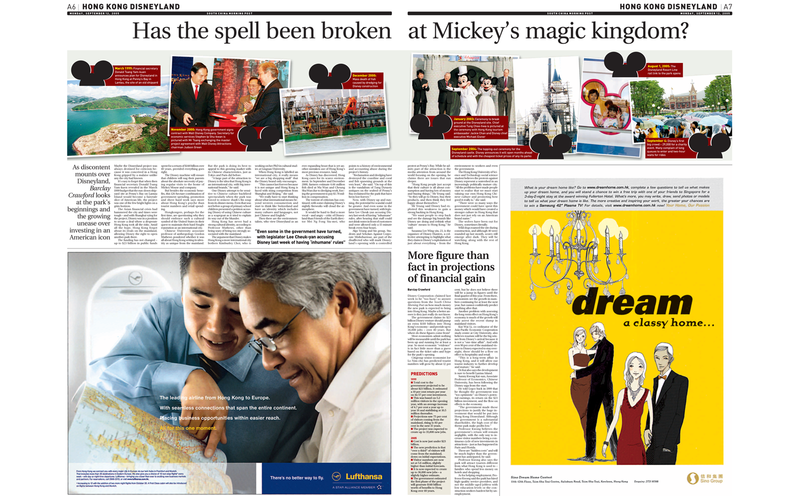 On 14 June 2012, the Hong Kong Economic Times reports that the Government of Hong Kong is hoping to start discussion with Hong Kong Disneyland about building a second Disney theme park for the resort. On 6 January 2015, the third hotel broke ground. It will be known as Disney Explorers Lodge, financed jointly by The Walt Disney Company (HK$1.7 billion), Hong Kong Government (HK$1.7 billion) and Hong Kong Disneyland (HK$600 million) itself, the hotel will have 750 rooms and opened on 30 April 2017. On 14 January 2015, the Hong Kong government announced it would talk with Disney about building a second park as part of Phase II of the resort. It is rumoured Phase II will also include the construction of more hotels. On 1 February it was reported the second park was hoped to be completed by 2020. In February 2016, Disney announced that the resort reported its first loss in four years, losing HK$148,000,000, and falling 9.3% in annual attendance, to 6.8 million visitors. Analysts attributed this to fewer mainland Chinese tourists visit, hurt by a combination of China’s slowdown, political unrest, and a weak yuan relative to the Hong Kong dollar, as well as the upcoming opening of the Shanghai Disney Resort. On 2 May 2017, The Walt Disney Company's proposal to invest HK$5.45 billion alongside the Hong Kong Government, for a six-year facelift at the loss-making theme park, is passed by the finance committee of the Legislative Council, after a total of more than 20 hours of debate in the Legislative Council since March. Hong Kong Disneyland, based on and modeled after the original Disneyland park in California, features 7 themed areas. Inspiration Lake, an artificial lake for recreational purpose and also serves the source of irrigation for the resort. There are three hotels in the Resort, located on the seashore of the reclaimed land and facing the South China sea, with about 1,750 rooms in total. There is also land reserved for a fourth Disney hotel, which will be located between Hong Kong Disneyland Hotel and Disney Explorers Lodge. Hong Kong Disneyland Hotel, a 400-room Victorian-era themed hotel inspired by Disney's Grand Floridian Resort & Spa and the Parisian Disneyland Hotel. Disney's Hollywood Hotel, a 600-room art deco style hotel themed to 1930s Hollywood, features lawns covering 8.5 hectares (21 acres) resembling the Hollywood glamour. Disney Explorers Lodge, a 750-room exploration themed hotel with four themed areas: Polynesian, Asian, South American rainforest and African plains. It is the biggest hotel in the resort and opened on April 30, 2017. The Resort has the key advantage of being linked to Hong Kong's public transit system. It is accessible via train from Hong Kong International Airport and the city centre. Inside the Resort free shuttle bus service is operated serving hotel guests. Since December 2016, the Star Ferry offers a daily trip from Tsim Sha Tsui Star Ferry pier in Kowloon to the Disneyland Resort pier, with a journey of about 45 minutes on their newly refurbished "World Star" boat. Hong Kong International Theme Parks, Limited (HKITP) is the joint venture between Government of Hong Kong and The Walt Disney Company in which they respectively own 52% and 48% currently. At the start, the Hong Kong Government held a 57% stake, while The Walt Disney Company had 43%. But after the expansion plans were announced in 2009, when The Walt Disney Company invested HK$3.63 billion (US$465 million), Hong Kong Government's holdings were reduced to 52% while The Walt Disney Company's shares increased to 48%. The resort operated at a loss from the time it opened in 2005 until 2012, when it first turned a profit. It was unprofitable again in 2015, running a HK$148 million loss that year. This increased to a loss of HK$171 million in 2016 and HK$345 million in 2017. ^ a b c d e f g SERVANDO, KRISTINE; Chu, Laurence (9 September 2015). "As Hong Kong Disneyland turns 10, a look back at park's roller-coaster history". South China Morning Post. Retrieved 16 June 2016. ^ a b Crawford, Barclay (12 September 2005). "Has the spell been broken at Mickey's magic kingdom?". South China Morning Post. Retrieved 16 June 2016. ^ Kan, Wendy (25 December 2000). Smells a Little Fishy. Times Asia. Retrieved 5 May 2007. ^ Yung, Chester (31 May 2005). End this 'barbaric and cruel waste' Archived 11 June 2009 at the Wayback Machine. The Standard. Retrieved 5 May 2007. ^ Hui, Sylvia (10 June 2005). Disney takes shark's fin off menu Archived 9 January 2009 at the Wayback Machine. The Standard. Retrieved 5 May 2007. ^ Crets & Hui (13 June 2006). New shark slap at Disney Archived 27 April 2010 at the Wayback Machine. The Standard. Retrieved 5 May 2007. ^ Under-fire Disney takes shark's fin off menu at Hong Kong park Archived 30 November 2007 at the Wayback Machine. Monster and Critics, 24 June 2005. Retrieved 5 May 2007. ^ Disney launches new HK theme park. BBC News. 12 September 2005. Retrieved 5 May 2007. ^ "Little League attracts big crowds". News.gov.hk. 30 July 2006. ^ "Disney set to miss mark on visitors" Archived 17 October 2007 at the Wayback Machine, The Standard, 5 September 2006. ^ "Disneyland finds little to celebrate on its anniversary" Archived 17 October 2007 at the Wayback Machine, The Standard, 12 September 2006. ^ Gentile, Gary. "TV, theme parks boost Disney's profit - USATODAY.com". usatoday30.usatoday.com. Associated Press. ^ "Attendance woes for Hong Kong Disney: report", Agence France-Presse, 16 August 2007. ^ "Hong Kong Disneyland Visitors Fall 23 Percent", Bloomberg, 18 December 2007. ^ "Hong Kong Disneyland Visitors Plunge in Second Year", Bloomberg, 18 December 2007. ^ Disney wishes more hotels Archived 3 June 2015 at the Wayback Machine Staff reporter. The Standard. Tuesday, 10 January 2012. ^ 海洋公園次輪擴建-料涉30億 (Ocean Park second phase expansion to cost about HK$3 billion) Hong Kong Economic Times. Thursday, 14 June 2012. ^ Qi Luo (6 January 2015). "New Disney hotel aims to be worth exploring". The Standard. Archived from the original on 3 June 2015. ^ "Talks expected on Disneyland Phase II expansion". ejinsight. 15 January 2015. ^ Daniela Wei (16 February 2016). "Magic Fades for Hong Kong Disneyland Ahead of New Shanghai Park". Bloomberg.com. ^ "Hongkongers will have to pay HK$5.45 billion for Disneyland facelift". South China Morning Post. 2 May 2017. ^ Hong Kong Disneyland Resort News Archives 2002 Archived 18 August 2007 at the Wayback Machine. Hong Kong Disneyland Resort. 21 November 2002. Retrieved 31 July 2007. ^ Victorian Opulence and Modern Luxury at Hong Kong Disneyland Resort Archived 12 July 2011 at the Wayback Machine. Hong Kong Disneyland Resort. 9 August 2005. Retrieved 13 February 2011. ^ Hollywood Hotel Art Deco Gem of the Resort. Hong Kong Disneyland Resort. 9 August 2005. Retrieved 13 February 2011. ^ Smith, Thomas. "Disney Explorers Lodge Opening at Hong Kong Disneyland Resort on April 30". Disney Parks Blog. ^ Cheng, Kris (20 February 2018). "Gov't-backed Hong Kong Disneyland sees net loss of HK$345 million in 2017 – third year in the red". Hong Kong Free Press. Wikimedia Commons has media related to Hong Kong Disneyland Resort.